Everyone should have a quick, simple recipe that can impress a crowd. You don’t always have enough time to make a bamboo cake, but that doesn’t mean you have to settle for mediocrity. You shouldn’t have to settle at all, frankly. This cinnamon swirl coffee cake hits the spot and bakes up in under an hour. 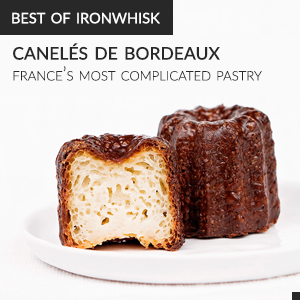 It’s perfect for when you’re in a rush but aren’t willing to compromise on flavour. Really simple, but also jaw-dropping good. I find the concept of a “coffee cake” quite confusing since it usually doesn’t refer to a coffee-flavoured cake but rather one that should be eaten with coffee. I can’t think of any other food that instructs you on how to eat it. Coffee cake is the only cake qualified, apparently. Nevertheless, it’s delicious. I took a basic coffee cake recipe, added a lot more cinnamon, and then added a cinnamon swirl to it to kick up the cinnamon flavour. You can’t ever get enough cinnamon in a coffee cake. The cream cheese icing complements the cinnamon nicely and makes the cake much more moist. Have a slice for breakfast with some coffee, or if you don’t drink coffee, have a slice with another slice! Cinnamon swirl coffee cake topped with pecans and frosted with cream cheese icing. Perfect for breakfast or for a coffee break. Recipe adapted from Chef Anna Olson's book Back to Baking. Preheat the oven to 350°F. Grease an 8-inch (20cm) square pan and line the bottom and sides with parchment paper. Beat the butter and sugar until it is light and fluffy. Add the whole egg and then the egg yolk, and beat well after each addition. Add in the milk. In a small bowl, stir together the sour cream, baking soda, and baking powder. Let sit for five minutes and then stir the sour cream mixture into the batter. Stir in the vanilla. Sift in the flour and salt and then mix in the cinnamon and nutmeg just until blended. The batter will be thick - this is OK. Spread the batter into the prepared pan. Mix all the ingredients together and pour over the batter. Run the blade of a knife through the batter to spread the cinnamon swirl throughout. Cut the butter into the flour, brown sugar, cinnamon, and salt with a pair of knives, forks, or with a food processor until pea-sized pieces form. Sprinkle the streusel topping over the batter. Sprinkle the pecans over the streusel, if using. Bake for 35 minutes, or until a tester inserted in the centre of the cake comes out clean. Allow the cake to cool completely in the pan before frosting. Beat the cream cheese and butter together until light and fluffy. Beat in the other ingredients. Pipe icing over the cake with a pastry bag, or spread over the cake as you wish. This looks delicious! I love coffee cake, especially with lots of cinnamon and pecans! Coffee cake is so good! I love it because it’s never overly sweet! This looks so incredibly tasty. Your picture is stunning, what kind of camera do you have?! Thanks! I have about a ten year old DSLR so that’s probably not what you want to get since there are so many better models out now. I played a lot with the natural light in this photo to get it to look the way it does. 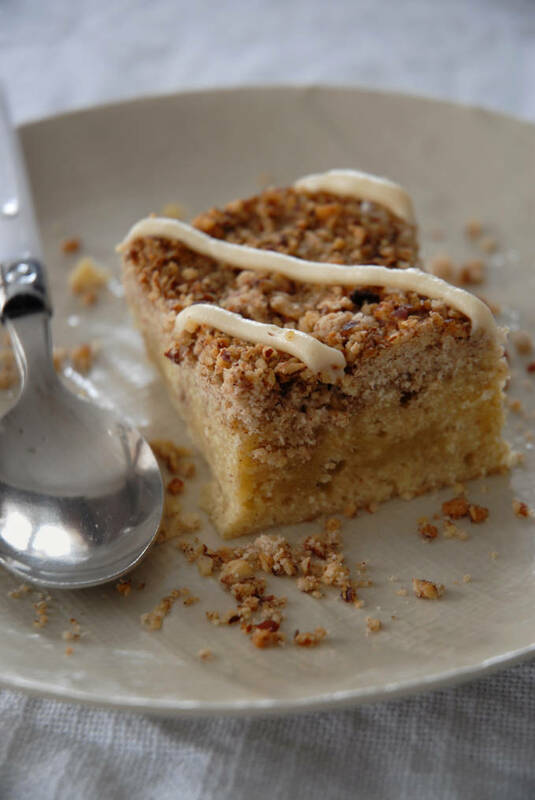 I am such a sucker for coffee cake…and if you add cinnamon, I’m over the moon. I agree, everyone should have that special recipe. Clearly, I need to try yours! Thank you for sharing…and brightening up a cold Wednesday morning. I hope you are having a great week! I agree, who has time to make a bamboo cake? It’s nice to have a go to recipe, particularly one that has so much panache. I love the heat cinnamon brings to sweets, it adds such a complex flavour. And the cake with a latté sounds perfect on this very drizzly, rainy, snowy chilly day.